Kaktiya University (School of Distance Learning and Continuing Education) invites applications for admission into MBA (Distance Mode) 2 Year Programme for the academic year 2015-16. Eligibility: Bachelor Degree in any Discipline with 40% aggregate marks. The candidates qualified in ICET-2014 or ICET-2015 can take admissions directly without appearing the Entrance Examination. How to Apply: Filled in applications form shall be sent to The Director, SDLCE, Kakatiya University, Warangal on or before 10.12.2015. Last date for receipt of filled in applications: 10.12.2015. Date of Entrance Test: 10.01.2016. 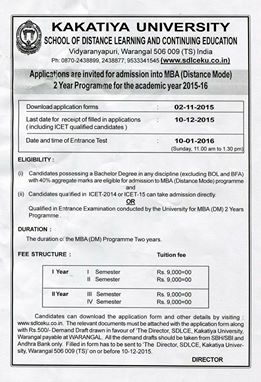 2 comments to ''KAKATIYA UNIVERSITY ADMISSION INTO MBA(DISTANCE MODE) Last Date 10.12.2015"